The value of the short circuit impedance Z% and the load (copper) losses (I2R) are obtained. The applied voltage is adjusted to pass the needed current in the primary/secondary. In order to simulate conditions nearest to full load, it is customary to pass 100%, 50% or at least 25% of full load current. Voltage to be increased gradually till the current in the energized winding reaches the required value (50% to 100% rated current). Measure the 3 Phase line currents at all tap position. If the tap-switch is an Off-Circuit tap-switch, the supply has to be disconnected before changing the tap. A consistent trend in the increase or decrease of current, as the case may be, confirms the healthiness of the transformer. If transformer is equipped with a tap changer, tapping regulations are applied. (1) If tapping range within±5% and rated power less than 2500kAV, load loss guarantee refer to the principal tap only. (2) If tapping range exceeds±5% or rated power above 2500kAV, it shall be stated for which tapping beside the principal tap the load losses will be guaranteed by the manufacturer. Three phase LT supply is applied on HV side of power transformer at normal tap with rated current on HV side and currents measured in all the phases on HV side and phases & neutral on LV side values noted. Readings to be taken as quickly as possible as the windings warm up and the winding resistance increases. Hence, the losses value will increase accordingly. Using appropriate instruments (conventional three watt meter method or digital watt meter with ammeters & voltmeters) measurements of voltage, currents and power can be recorded. To avoid CT’s and PT’s, this method can be used at current levels of 2 to 5 A and measurement of load losses is done at this condition. This measured load loss is then extrapolated to actual load currents to obtain load losses at the operating current. Example: – 11 kV/433 V, 1000 kVA transformer with 5% impedance, the voltage to be applied on H.V. side during load test is estimated below. Line to line voltage to be applied on H.V side Visc=(11x1000x5xx/x0.866×52.5×100)=60.5 volts. Since the current drawn on H.V. side is only about 5A in this test, CT’s can be avoided and hence phase angle error is not applicable. Measured impedance to be within guaranteed value and nameplate value. Load losses to be within guaranteed values. Deviation in name plate value. In this test, the value of No-Load power (Po) & the No-Load current (Io) are measured at rated voltage & frequency. Test is performed at rated frequency. Two voltmeters are connected to the energized winding, one is measuring the voltage mean value and the other is for the Voltage R.M.S value. Readings of watt meters, Voltmeters & Ammeters are recorded to obtain the values of V (r.m.s), Vmean, Po and Io at each voltage step. Test results are considered satisfactory if the readings of the two are equal within 3%. If it’s more than 3%, the validity of the test is subjected to agreement. No Load losses to be within guaranteed values. To know the continuity of windings of the transformer. Magnetizing current test of transformer locates the defects in the magnetic core structure, shifting of windings, failure in turn to turn insulation or problem in tap changers. These conditions change the effective reluctance of the magnetic circuit, thus affecting the electric current required to establish flux in the core. Three phases LT Voltage of 415 V applied on HV side of Power transformer and currents are to be measured with mill ammeter. First of all keep the tap changer in the lowest position and open all IV & LV terminals. Then apply three phase 415V supply on the line terminals for three phase transformers and single phase 230V supply on single phase transformers. Measure the supply voltage and electric current in each phase. Generally there are two similar higher readings on two outer limb phases on transformer core and one lower reading on the center limb phase, in case of three phase transformers. An agreement to within 30 % of the measured exciting current with the previous test is usually considered satisfactory. If the measured exciting current value is 50 times higher than the value measured during factory test, there is likelihood of a fault in the winding which needs further analysis. 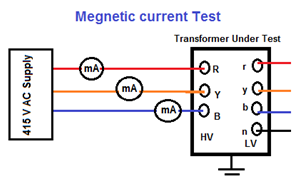 This magnetizing current test of transformer is to be carried out before DC resistance measurement. Turns Ratio Test / Voltage Ratio Test are done in Transformer to find out Open Circuited turns, Short Circuited turns in Transformer winding. This test should be made for any new high-voltage power transformer at the time it is being installed. With use of Turns Ratio meter (TTR), turns Ratio between HV & LV windings at various taps to be measured & recorded. The turn’s ratio is measure of the RMS voltage applied to the primary terminals to the RMS Voltage measured at the secondary terminals. Np=Number of turns at primary winding. Ns= Number of turns at secondary Winding. The voltage ratio shall be measured on each tapping in the no-load condition. Turns Ratio meter (TTR) to energies the transformer from a low-voltage supply and measure the HV and LV voltages. 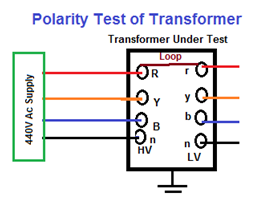 Transformer ratio test can be done by Transformer Turns Ratio (TTR) Meter. It has in built power supply, with the voltages commonly used being very low, such as 8, 10 V and 50 Hz. The HV and LV windings of one phase of a transformer (i.e. R-Y & r-n) are connected to the instrument, and the internal bridge elements are varied to produce a null indication on the detector. Values are recorded at each tap in case of tapped windings and then compared to calculated ratio at the same tap. The ratio meter gives accuracy of 0.1 per cent over a ratio range up to 1110:1. The ratio meter is used in a ‘bridge’ circuit where the voltages of the windings of the transformer under test are balanced against the voltages developed across the fixed and variable resistors of the ratio meter. Adjustment of the calibrated variable resistor until zero deflection is obtained on the galvanometer then gives the ratio to unity of the transformer windings from the ratio of the resistors. 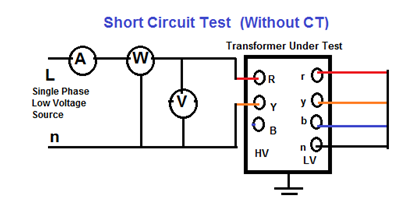 transformer as shown in the figure above and it should be changed until a balance occurs in the percentage error indicator. The reading on this indicator implies the deviation of measured turn ratio from expected turn ratio in percentage. 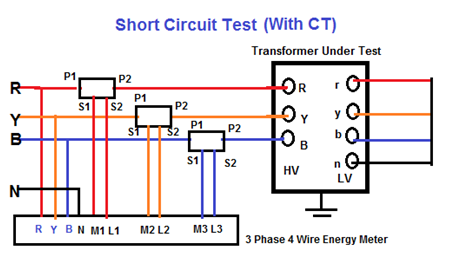 Out-of-tolerance, ratio test of transformer can be due to shorted turns, especially if there is an associated high excitation current. Open turns in HV winding will indicate very low exciting current and no output voltage since open turns in HV winding causes no excitation current in the winding means no flux hence no induced voltage. But open turn in LV winding causes, low fluctuating LV voltage but normal excitation current in HV winding. Hence open turns in LV winding will be indicated by normal levels of exciting current, but very low levels of unstable output voltage. The turn ratio test of transformer also detects high resistance connections in the lead circuitry or high contact resistance in tap changers by higher excitation current and a difficulty in balancing the bridge. Disconnect all transformer terminals from line or load. This test is done to check both the transformer voltage ratio and tap changer. When “Turns Ratio meter” is not available, Voltage Ratio Test is done at various tap position by applying 3 phases LT (415V) supply on HT side of Power transformer. In order to obtain the required accuracy it is usual to use a ratio meter rather than to energies the transformer from a low-voltage supply and measure the HV and LV voltages. At Various taps applied voltage and Resultant voltages LV side between various Phases and phases& neutral measured with precision voltmeter & noted. With 415 V applied on high voltage side, measure the voltage between all phases on the low voltage side for every tap position. At other taps values will be as per the percentage raise or lower at the respective tap positions. In case of Delta/Star transformers the ratio measure between RY-rn, YB-yn and BR-bn. Range of measured ratio shall be equal to the calculated ratio ±0.5%. Phase displacement is identical to approved arrangement and transformer’s nameplate. The IEEE standard (IEEE Standard 62) states that when rated voltage is applied to one winding of the transformer, all other rated voltages at no load shall be correct within one half of one percent of the nameplate readings. It also states that all tap voltages shall be correct to the nearest turn if the volts per turn exceed one half of one percent desired voltage .The ratio test verifies that these conditions are met. or 0.1 times the actual short circuit impedance. Other taps on the first winding pair and other winding pair must be agreed upon, and must be lower than the smaller of the two values stated above. 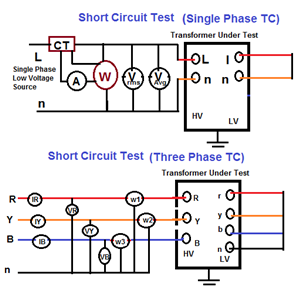 Measurements are typically made by applying a known low voltage across the high voltage winding so that the induced voltage on the secondary is lower, thereby reducing hazards while performing the test .For three phase delta/wye or wye/delta transformer, a three phase equivalency test is performed, i.e. the test is performed across corresponding single winding. Shorted turns or open circuits in the windings. Volt Meter. A Ratio meter may not always be available and this is usually the case on site so that the polarity may be checked by voltmeter. The primary and secondary windings are connected together at one point. Low-voltage three-phase supply (415 V) is then applied to the HV terminals. Voltage measurements are then taken between various pairs of terminals as indicated in the diagram and the readings obtained should be the phasor sum of the separate voltages of each winding under consideration. R and r should be shorted.